Pop quiz, hotshot: name every type of wedding professional that you can think of. Time’s up. You probably said things like DJ, caterer, florist, maybe venue coordinator. Did you say makeup artist? If not, I’m not surprised. For some reason, that’s something that gets overlooked on the big day, with many brides choosing to do it themselves or have their beloved aunt do it. But that’s foolhardy. Not to impugn your makeup skills, but this is the biggest day of your life and the one where it is most important to look beautiful. Your face is the capital of your beauty. Why not have a professional do you up right? As professionals go, they don’t get better than Michelle Miralles Davis of Sparkle Makeup Artistry. Based in Virginia, she’s done weddings all over North America, including the United States, Mexico, and her native Guatemala. She’s in demand because she’s the best. 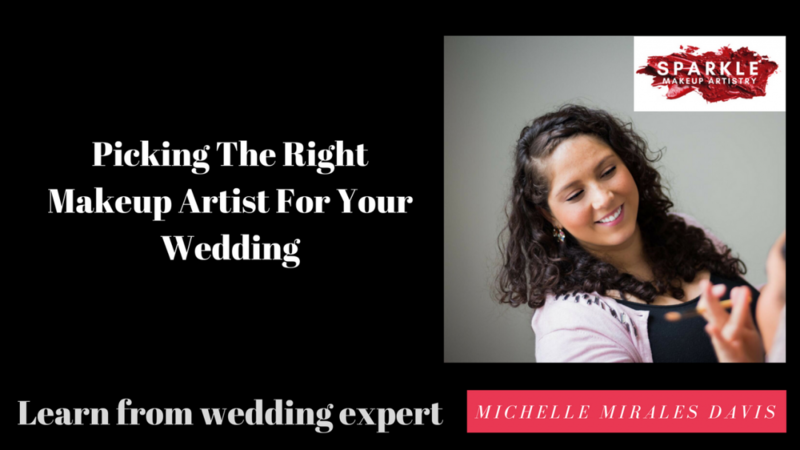 She recently sat down with me, Eric Herod, of Wedding Pros TV to give us the skinny on how to pick a makeup artist for your wedding. Here are a few excerpts. 1 || Find A Makeup Artist Passionate About What They Do. Miralles Davis is so passionate about her craft that when I asked her what she would be doing professionally if she wasn’t a makeup artist, she had no answer. That level of passion, and wanting to make a real difference to their clients, is what you want. 2 || Find A Makeup Artist Who Is Thorough In Getting To Understand You And Your Skin. If your potential makeup artist is NOT asking you these questions, run the other way. The specific beauty of Miralles Davis’s approach, however, is in that word “beforehand.” Since she gets to the bottom of her clients before they get in her chair, the process itself is straightforward and as stress-free as can be. 3 || Find A Makeup Artist That Fits Your Style. You may think that makeup artists all have the same skillset and styles, but that’s a misconception; each makeup artist has their own unique, signature talents, so it’s important to find the one that best suits your makeup tastes. 4 || Find A Makeup Artist That Understands The Importance of Cleanliness. “Ask (potential makeup artists) how comfortable are they with skin care,” says Miralles Davis. 5 || Find A Makeup Artist Who Understands How Your Life Habits Impact Your Skin. If you can’t find that, don’t worry. Miralles Davis has some questions you can ask yourself to get you on a path to better skin. Hint: eat healthily, sleep well, drink lots of water, and avoid stress when possible. “What are you doing, for the past year to six months? What are you eating? What are you drinking? How much are you drinking? How well are you sleeping? Is work causing you a lot of stress?